Ivermectin Spot-On Drops are used to treat small animals and birds for mites and feather lice. The drops are easy to apply and each bottle contains a full course of treatment for 50 birds. Pharmaq Ivermectin can be used as a preventative measure as well as for treatment. Ivermectin 1mg/ml in a propylene glycol base. 1% - 5ml - For rabbits, guinea pig, ferrets and rats. 1% - 10ml For large ornamental birds. 0.1% - 10ml - For small ornamental birds. Apply the appropriate dose (one drop per 50g bodyweight) on the back of the neck, between the shoulder blades, once per week for three weeks. Do not allow the animal to swallow the product. from a veterinary surgeon. Do not use in animals other than those indicated. Serious reactions, including deaths, have been reported in dogs (especially Collies, Old English Sheepdogs and related breeds), tortoises and turtles treated with products containing the active substance. If signs of disease persist beyond 7 days, or reappear, then advice must be sought from a veterinary surgeon. No data available on the use of PHARMAQ Ivermectin Drops during pregnancy or lactation; do not use on pregnant or lactating animals. Below are some recent questions we've received regarding Pharmaq Ivermectin Spot-On Drops, including answers from our team. Unfortunately there is no data showing whether this product is safe for use in pregnant and lactating does, and the manufacturer recommends that it is not used during pregnancy/lactation. 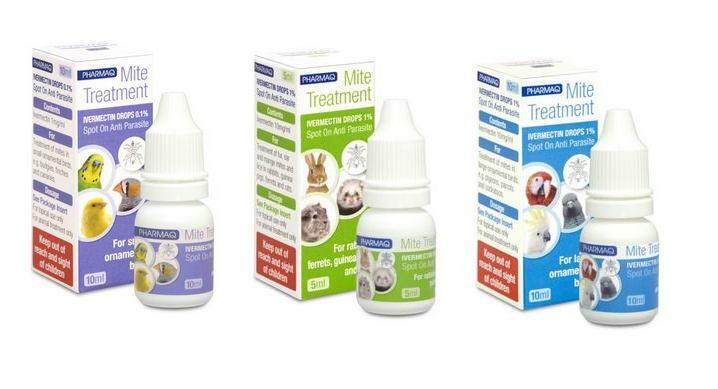 If you can confirm what parasites you need to treat (internal such as worms, or external like mites), we will try to recommend an alternative for you. Alternatively, your vet will be able to tell you which they think is best for your doe. How often should I apply Ivermectin as a preventive method? This depends on the level of risk which will vary from one location to another. Many people do not use anything like this at all unless there is a new reason to. More usually people will look for signs of trouble and then treat accordingly at the first signs. I have a chicken with a bad infestation of lice. I was considering using ivermectin spot on to treat it. I want to know what length of egg withdrawal I should use if I treat all the birds. Unfortunately, there isn't an ivermectin based product licensed for use in chickens, so in order for us to be allowed to supply it, you would need to speak to your vet and ask for a prescription. Your vet would be able to advise you of a suitable withdrawal time for the product but the eggs shouldn't be sold or given away to friends. If you wanted to try a product approved for use in chickens first, Johnsons Poultry Mites & Lice Powder would be a good place to start. This can be used on the chickens and the coop, and you can continue to eat the eggs after and throughout treatment if you wish.